Indiana pulled out a huge road win over then-No. 6 Michigan State on Saturday, snapping a seven-game losing streak and rekindling hope that this season could end with an NCAA Tournament appearance. 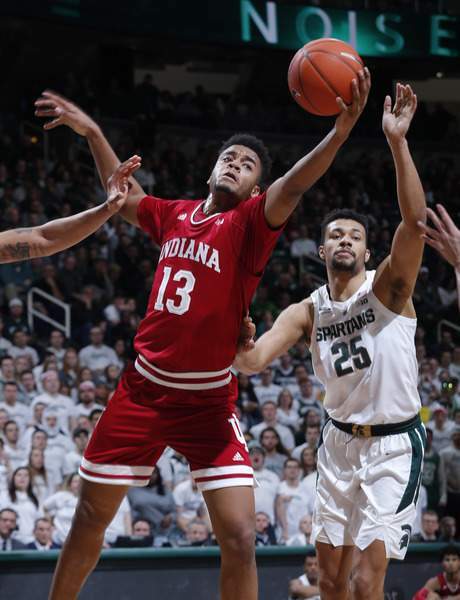 The Hoosiers beat the Spartans while one of their best players, senior forward Juwan Morgan, languished on the bench with a shoulder injury. Late in the first half, Morgan dove on the floor for a loose ball and got his arm caught, twisting his left shoulder unnaturally. It was the same shoulder on which he'd had surgery as a freshman. He left the court in obvious pain and did not return. The Hoosiers were able to beat the Spartans without him (a feat I am still trying to understand), but it's clear that losing Morgan for an extended period of time would be a massive blow to this team's postseason chances. Fortunately for the Hoosiers, it seems that Morgan could be back in the lineup soon. On his radio show Monday night, coach Archie Miller said Morgan returned to practice Monday and is progressing well ahead of the Hoosiers' matchup Thursday against Iowa at Assembly Hall. "He probably dodged a bullet,” Miller said. “I think, more than anything with Juwan, there’s some concern there because he’s had shoulder injuries, a shoulder that went out quite a bit (his freshman year), then it was repaired. I think, more than anything, when he was on the ground and it was extended behind his head, the bodies that were landing on him hyper-extended it and stretched him. I think, number one, (he was) in pain. Then two, it probably (put) a scare in him, like, 'Oh no, not again.'" It's still unclear whether Morgan will be able to play against the Hawkeyes, but the four days off between games should give him a chance to get the maximum amount of treatment. The Waynesville, Missouri, native is second on the team with 15.9 points per game and is the Hoosiers' leading rebounder at eight boards per contest. "I don’t think (Morgan) is 100 percent," Miller said. "But hopefully by the end of the week, he’s feeling a little bit better without any setbacks." The key going forward might be how much rest the Hoosiers are able to give Morgan. De'Ron Davis returned from a three-game absence to play 25 minutes against the Spartans, filling in admirably for Morgan and scoring 12 points. Davis is still getting back to 100 percent with his ankle injury, however, and it's unclear whether he'll be able to repeat that kind of performance on a consistent basis. Even if he can't, it would still be huge for Indiana if he could spell Morgan for 10-15 minutes per game and also share the court with him at times when Indiana wants to play a super-big lineup. The combined health of Morgan and Davis will go a long way toward determining Indiana's fate in March.